Posted on December 5, 2017 by Enough is Enough! all our NoG20 reports; here. On the same day there were solidarity demos in Hamburg.. Image: German cops during today-s police raid against Rotes Zentrum. 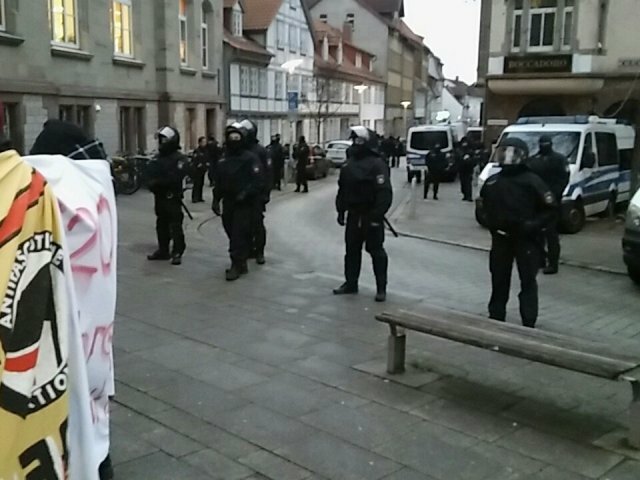 In Göttingen activists spontaneously took the streets during the raids. Several people were injured during the raids, one of the injured people had to be brought to hospital by ambulance. In Bonn cops raided Verdi-Jugend, the youth organisation of the Verdi union, one of the biggest labour unions in Germany. Several members of the youth organisation of the union were temporarily detained during the NoG20 protests in Hamburg. But in the early afternoon Verdi could not confirm that official facilities of Verdi were raided. According to German daily Neues Deutschland the cops said that the raids were solely related to the events in the morning on July 7 at Rondenbarg Straße in Hamburg. This was the area where Fabio was arrested, who was released on November 27. During the police operation at Rondenbarg 11 people were severely injured on July 7. Today’s raids can be seen as another stage in the massive disinformation campaign by German politicians and the cops. The disinformation campaign started before the NoG20 protests and seems to be an ongoing operation. It’s expected that people will take action against the massive wave of repression. After the showcases in German courts, the threats to evict the Rote Flora, the closure of Linksunten Indymedia people have had more than enough. One of the first possibilities where people can take action is during this weeks conference of the German ministers of interior. On December 7 there will be a demonstration against the conference in Leipzig, Germany where the conference (of all German states and the federal minister of interior) will take place . The demo starts at 05:00pm (17:00) at the main train station (Hauptbahnhof) in Leipzig.